As I have combed the Chinese web browsers over the past few weeks, I was rewarded with this picture late Saturday night. At about 11:00pm I copied and pasted the Chinese character of Mariah's name into the search engine. Then I scoured through about twenty "finding stories" to come across this sweet baby. Even though Google Translate would not translate the file that was embedded in this specific site, I still saw our baby. Then I sat and cried. I was able to match the Arabic numerals with the dates of her birth and finding. There she was, just staring back at me. Jeremy was in the shower.......so I did what any good wife/mommy would do, I practically screamed. He came pretty fast! He had no idea that I had been searching for weeks for her finding picture. When he saw it, he was in awe. How blessed we were to come across this little "diamond". She was tucked away toward the bottom of the list of about twenty other babies. He story was very similar to the others. We were truly amazed that we found her picture and her story. As we sit here and recount her story, it is truly God's story. He ordained her to be born in China. He ordained her to be our daughter! Mariah Claire Lu Ping Kaminski is just as precious as any of our children. 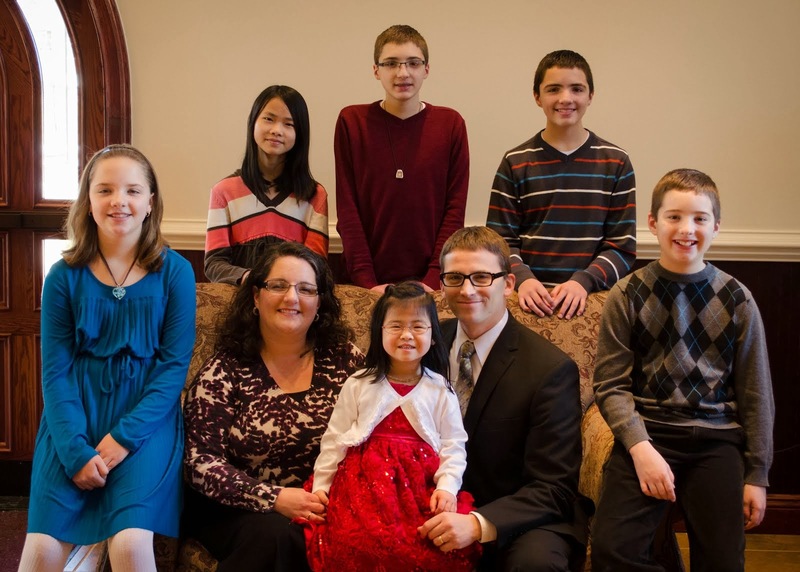 Kyle, Micah, Rebecca, and Benjamin are our children born in the United States and Mariah is our daughter born in China. There is really no other way to see it. She is ours! She does not look like us, but she is definitely a Kaminski! Jeremy and I were just talking about our journey. We stand amazed at God's plan for her life and ours. We began our journey in full force in December of 2010, on our knees in prayer. We were not sure where we were being led. What was God doing in our hearts? This is when Mariah was born......December 14, 2010. This baby's birth was known to the Lord but we had no idea that our daughter had just been born! It is amazing to see how the details of this journey are being revealed to us in little bits and nuggets. God is so good! Yesterday, I spent a good part of my morning arranging for a cake to be delivered to Mariah at her orphanage. We asked for a letter to be translated to the orphanage director. In that letter we thanked them for loving our little baby and asked that they would celebrate her Forever Family (us) with the director, nannies and other children she lives with by eating some of that delicious cake. We are hopeful that the orphanage will share pictures of the celebration. I cannot wait to share those pictures with all of you. "Before I formed you in the womb I knew you, before you were born I set you apart.."
This is a very difficult post for me, so just bear with me. Jeremy and I received a phone call last Thursday letting us know that Jeremy's sweet grandfather was taken to the hospital and not expected to survive. That was a tough phone call for me to then make to Jeremy. On Saturday evening, Pap Leard drew his last breath. Above is a sweet picture of four of our kids with Grandma and Pap Leard several years ago at Christmastime. There were so many people that came to the funeral home to pay their respect to this family. I was amazed at the lives that one simple man touched. He was a husband, a father, a grandfather, a great-grandfather, a brother, a friend, and most importantly a man of God. He loved to study and read his Bible. He touched the lives of all who had the privilege of knowing him. If you ever met Pap, you heard the Word of God in his ever so gentle way. As the funeral plans were being made on Sunday afternoon Jeremy, me, and the kids stayed at Grandma and Pap's house and took down the Christmas tree and all decorations. As we were cleaning up we were looking through drawers for bags, tape etc. We found countless notes that Pappy left. He had Scripture written on some, sermon notes on others, and Bible study notes on even more. Talk about a legacy! Can you imagine what it might be like for Grandma to come across these notes as she goes about her day? Jeremy's dad and Pappy's pastor (Jonathan Hill) had the funeral on Wednesday morning. It was emotional yet God-honoring. This is how Pappy would have wished. He wanted the focus on the Lord, not on him. Jeremy's dad sang part of the song "Give Me Jesus" acapella. It was beautiful! Pastor Hill ended the funeral service with a beautiful prayer and personal touch that Pappy deserved. Personally, I was even more honored to be a part of this family. Much like adoption, I was taken in by this family. I was given status I did not deserve. I was loved by this gentle spirit as one of his very own grandchildren. I am humbled to have known this man for twenty-two years. I loved him deeply. This past week has also stirred my own memories of my grandparents who have passed away. Such fond memories I have of my grandparents! We are emotionally and physically exhausted but are resting in God's promises to us. Then we had wonderful news as well. On Tuesday January 17, 2012 we are officially DTC! For those of you who are not familiar with adoption terminology, that means our dossier is on its way to China! This is a huge step. As a sweet friend wisely put it, we have pushed the papers over the the other side of the ocean, FINALLY! I have created this blog to help celebrate our family's journey to get our newest daughter, Mariah Claire Lu Ping Kaminski. I apologize that the first blog is long but it shares our hearts. Our journey began when I was about 15 years old. It's too many years ago to count now! My mom and I were hanging clothes outside while listening to Dr. James Dobson on his radio program. He was interviewing women who had recently returned from visiting several orphanages in China. The conditions they described brought tears to my eyes. These children were mostly girls. The stories they shared are burned into my memory. That was the day the Lord planted a seed in my heart which would later be shared with my sweet husband. After Jeremy and I started our family in 1999, we were busy with life. We had four children born in 4 years and 10 months. I was a busy stay-at-home-wife and mom. Our life took a turn with the birth of our youngest son. He was born with a tethered spinal cord and spina bifida. It seemed as though that began many years of additional health problems and six specialists. Then about a year ago, Jeremy and I were in our van and we heard the kids arguing. Rebecca made the grand announcement to her brothers that when we get our new little girl from China, she was going to sit beside Rebecca so she could take care of her. A little surprised, Jeremy and I just looked at each other and smiled. Evidently the kids overheard our conversations over the years. Little did we know that on that day, our journey to Mariah began in full-force. I had discovered a few years before, that in the front of Jeremy's Bible he writes down his specific prayers. Our immediate family is listed first, then Jeremy simply wrote.....our adoption. He didn't share that with me. I felt guilty for seeing it, but then I smiled and knew that God was at work and I never even knew it. We filled out the application to our first agency in March of 2011 and formally began the process. We were quickly matched with a 15-month old but God had different plans. China did not approve us. We examined our hearts and wondered what to do. So we went to our knees in tears and prayed, broken-hearted. A close friend recommended we look into a different agency. That is how we came in contact with Lifeline Children's Services. They were certainly the answer to prayer that we were seeking. They prayed with us and for us. They walked us through the extremely difficult process of home study laws for an international Hague adoption in West Virginia. We had to take required classes to become certified foster parents. But, we had an absolutely wonderful social worker who came to our home for personal classes every Friday for 4 months. Our home study was finally completed after countless visits from our social worker. This also involved fingerprinting by our local police station, FBI, and even biometric fingerprinting for the Department of Homeland Security. We completed physicals for the entire family. We completed required online reading from the U.S. State Department. We read a book entitled The Connected Child. We read a 480 page book that was also required for our Hague training. We completed and passed CPR training. We completed and passed our Bloodborne Pathogens class. We completed and passed a Passive Restraint class. We are also required (in WV) to continue adoption education. I have continued to read and research as much as possible regarding attachment and bonding of adopted and institutionalized children. Countless hours have been spent on preparing paperwork for immigration and applications for grants. "the call." Our social worker was on the other end of the phone and it went something like this, "Hi Jeanine, this is Logan. How are you? We have two possible matches for you. Do you think you would be interested in both, one or neither? Both are little girls. One will be 3 in February and the other little girl just turned a year old one week ago today." Jeremy and I immediately said, "YES! WE WILL REVIEW THEM BOTH!" We officially accepted the file for the younger little girl. After filing our Letter of Intent (LOI) at midnight December 22nd, we then waited for China to grant us preliminary approval (PA). We agonized over Christmas for this sweet baby not being with us. It was a difficult time. Then on January 4, 2012, twelve days later, we received and email from Lifeline that went something like this......"Congratulations! You received your PA from China today, January 4, 2012!" I honestly think our agency was almost as excited as we were. Then we had to decide on a name for this sweet baby girl. After 2 days of research, we agreed on the name Mariah Claire Lu Ping. Mariah is Hebrew and means "God is my teacher". Claire is Jeremy's grandmother's middle name, which she goes by, meaning "bright". We kept her Chinese name as well. I had a friend who offered to have her friend translate what Chang Lu Ping means by looking at the actual Chinese script. Her interpretation is something like this. Chang is likely the first syllable of the city of her location and means "always". Lu means "road". The symbol for Ping means "flat". So her interpretation was that the orphanage director's wish was for her to have a life of "always a flat road". We thought that was sweet. Now we are waiting for our paperwork to get back from the U.S. Consulate in Houston to our agency. They will overnight it then to China and we will be DTC (Dossier to China.) Then about three weeks later we will have our LID (Log In Date). Then we begin the wait for our LOA (Letter of Acceptance). From there it seems to happen quickly. We will wait for a few more approvals then we get on the plane to get our daughter! We pray we can get her in June or July. The sooner, the better for her and us. Jeremy and I will spend 10-14 days in China. We cannot wait!!! So, hold on to your seats. This is quite the ride. But please pray for Mariah as she lives in an orphanage. Pray for us to be prepared for being the parents of five children. 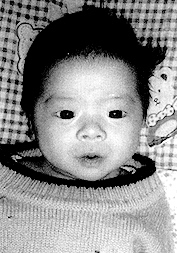 Pray for the orphanage workers as the do their very best to care for those babies. Pray for us to gain the needed funds to complete this adoption. We are praying for Mariah's transition and that her grieving process be mild and quick. We also pray for our four kiddos here. They are so sweet and super excited to welcome her home.